I managed to get in some studio time of late to finish off some orders, and get a few pieces photographed. Years ago I read that an artist should take photos of everything they make regardless of whether it is going to be a personal gift or go up for sale (or already sold for that matter). Time to start getting into the habit. Jewelry photography is a tedious task, requiring very bright lights with a light tent to control reflections and shadows. I keep thinking I need to set up a photo spot in the studio, such that it is not such an effort setting everything up each time. 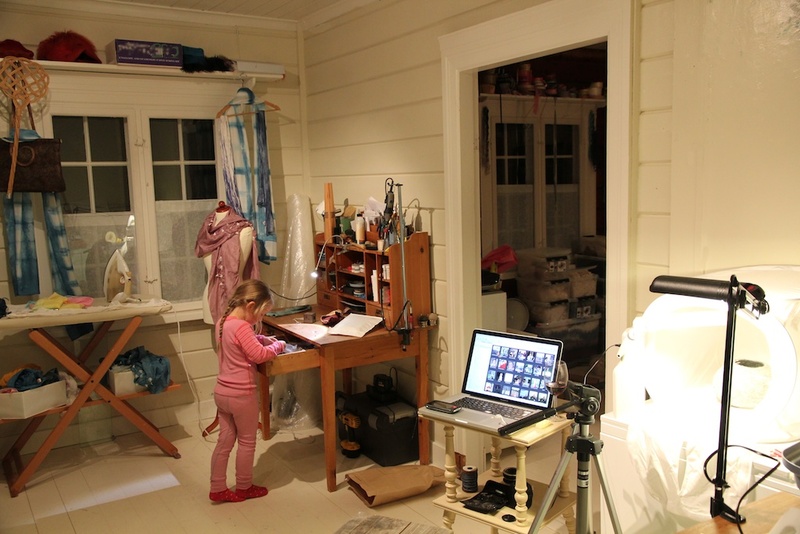 My children spend quite a bit of time with me in the studio.. asking questions, playing on the floor.. digging through all the tools and supplies while dreaming of what they want to make next (they now even have their own cupboard of supplies). A typical studio shot.. on the right, the tripod and light tent (on top of the centrifuge), with laptop at hand. Workbench, with power tools underneath and packages in need of labeling to get to the post office. My daughter, forever curious going through my stash of jewelry... Silk shibori scarves hanging all over in need of pressing and packaging. In the background (next room) boxes and boxes of wool and silk, and ribbons hanging down from their spools over the window. It has been a productive time, and with studio visits scheduled later this week with neighborhood children, there will be lots of laughter and fun in these rooms… but for now, a few images from last night. what do the words mean in English Cynthia? “Troen på friheten er sterkere enn frykten” translates to “The belief in freedom is stronger than fear”. Words spoken by the Norwegian King in his speech to the people after the terror attack on July 22nd of this year. He asked us all to take care of each other.. very moving words.. very moving times. Thanks, yes, that was an important choice Norway made. Thanks.